What is the composition of FibraMent? What size FibraMent Baking Stone should I buy? Can my FibraMent Baking Stone be cut to a custom size? Can I lay a sheet of aluminum foil over the FibraMent Baking Stone to keep it from staining? Can FibraMent be used in wood burning ovens and outdoor patio grills? Some publications have recommended baking on quarry tile. How does FibraMent compare to quarry tile? Can FibraMent be placed directly on a heating element in electric ovens? Can a second stone be used above the food to provide even more stone oven effect? Do thicker stones improve baking performance? Why doesn't the stone include a wire rack? Can I leave my baking stone in the oven during the cleaning cycle? When I baked my last pizza some sauce and cheese spilled onto the stone. How should I clean it? Why is it necessary to pre-dry/temper the stone? When I opened the carton I noticed some chips on the edges. Should I be concerned? Some baking stone suppliers state their material absorbs moisture during the baking process. Is this the case with FibraMent? Are there any differences between the Barbecue Grill stones and Home Baking Stones? Can I use the FibraMent Barbecue Grill Baking Stone in my home oven? What types of ovens will the FibraMent work in? What warranty does the FibraMent carry? 1. What is the composition of FibraMent? FibraMent is made from a proprietary (trade secret) blend of heat resistant and conductive raw materials approved by NSF (the National Sanitary Foundation) for use in baking ovens, with food-contact. 2. What size FibraMent Baking Stone should I buy? 3. Can my FibraMent Baking Stone be cut to a custom size? 4. Can I lay a sheet of aluminum foil over the FibraMent Baking Stone to keep it from staining? Most users bake directly on the stone, but aluminum foil will not alter FibraMent's baking properties. However, all baking stones are porous and will darken over time. Additional benefits of using aluminum foil are: thermal shock will be minimized and excess moisture will be prevented from contacting the stone. 5. Can FibraMent be used in wood burning ovens and outdoor patio grills? Although FibraMent has a 1500°F continuous use operating temperature limit, it cannot be exposed directly to flame. The flame diverter that comes with our barbecue grill stones must be used. 6. Some publications have recommended baking on quarry tile. How does FibraMent compare to quarry tile? Quarry tile doesn't provide an even bake because it lacks the heat transfer properties necessary for quality baking. It also isn't engineered for baking oven temperature applications, so it becomes brittle after it's been heated. Quarry tile also may contain lead. 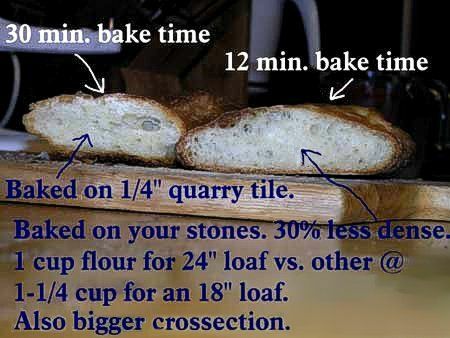 This user-submitted photo compares the results of baking on a common quarry tile vs. the FibraMent baking stone. 7. Can FibraMent be placed directly on a heating element in electric ovens? No. Nothing should be placed on the oven's heating element. Setting baking stones or pans on the element restricts the heat flow. This gradually decreases the efficiency of the element until it fails. 8. Can a second stone be used above the food to provide even more stone oven effect? Yes. For home ovens, place one baking stone on the wire rack at the very bottom of your oven. This will be your baking surface. Use a second FibraMent stone as the ceiling by placing on the wire rack above. Adjust the height of the wire rack so it's immediately over the foods you are baking. Since this greatly reduces the ceiling height of the oven and redirects heat back down on the items being baked, wall inserts are not necessary. Our tests show using this method further improves the bake quality. 9. Do thicker stones improve baking performance? Thermal conductivity or heat transfer is independent of thickness. Baking stones provide direct bottom heat to your food items. Thickness of the stone does not change the heat transfer rate. For baking stones to work properly the heat must be conducted evenly. Some baking stones conduct heat too quickly while other stones conduct heat too slowly. FibraMent's heat transfer rate is 4.63 Btu in./hr./sq. ft. tested to ASTM Standard C177-95. This is the ideal heat transfer rate. Thicker stones (1", 1-1/2" and 2") are primarily used in commercial ovens where additional strength and recovery times are required. FibraMent baking stones 3/4" thick last for many years in home use. 10. Why doesn't the stone include a wire rack? Baking stones should be left in the oven. Food bakes at temperatures over 200°F. FibraMent will stay above 200°F for at least thirty minutes after it's taken out of a 400°F to 500°F oven. You do not want your food to continue to cook after it is taken out of the oven. Also, you will probably burn your fingers trying to take a slice of pizza off the hot stone. 11. 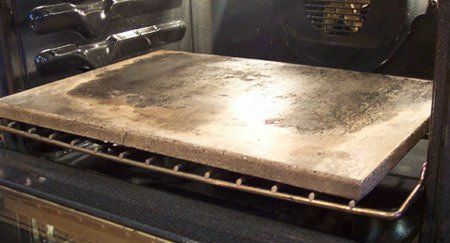 Can I leave my baking stone in the oven during the cleaning cycle? Baking stones are porous and absorb anything that comes in contact with them. It's best to take the stone out of the oven when it goes through the cleaning cycle. You can leave the stone in the oven if you want, but be sure to prevent any foreign residue from dripping on the stone. 12. When I baked my last pizza some sauce and cheese spilled onto the stone. How should I clean it? Take a dry rag and wipe off as much of the residue as you can. Use a rubber spatula to remove any stubborn spills. Be careful not to damage the surface of the stone. You can also bake-off the heavy spills. Instead of turning the oven off when you are through baking, turn it up to the highest temperature setting for 60 to 120 minutes. This will charcoalize the residue spilled onto the stone. Remember baking stones naturally darken and discolor over time with use. The grease and toppings that drop on the stone actually improve the baking properties by sealing the surface of the stone and minimizing the chance of dough sticking to the surface. This stone has been used several times a week for the last five-plus years. 13. Why is it necessary to pre-dry/temper the stone? Since baking stones are porous they absorb moisture. Moisture turns to steam at 212°F. If the moisture is forced out of the stone too quickly it can develop cracks. This is why a slow, gradual temperature increase is so important. It's an easy process, and instructions are included with your stone. Even if the stone was pre-dried at the factory it would pick up moisture during shipment to you. To ensure there was a nominal amount of moisture in the stone the pre-drying process would have to be repeated. 14. When I opened the carton I noticed some chips on the edges. Should I be concerned? Due to the inherent nature of the raw materials used in FibraMent, the edges may have some small chips. These areas are not defective and do not affect the baking properties of FibraMent. 15. Some baking stone suppliers state their material absorbs moisture during the baking process. Is this the case with FibraMent? Baking stones work by providing even, direct heat to the food being baked. Consistent thermal conductivity ensures that all parts finish baking at the same time. A baking stone does not draw moisture out of the dough, but as heat is transferred from stone to food, some moisture is naturally driven out of the food in that area, just as in other surface areas where crust is formed. Good quality baking stones enhance results by baking through the dough at an even pace. 16. Are there any differences between the Barbecue Grill stones and Home Baking Stones? No, the same formula matrix is used. 17. Can I use the FibraMent Barbecue Grill Baking Stone in my home oven? 18. What types of ovens will the FibraMent work in? 19. What warranty does the FibraMent carry? Your FibraMent stone carries a ten year manufacturer's warranty. And you might call it a "reality-based" warranty because FibraMent stone breakage is extremely rare. Some stones are marketed with lifetime warranties that are, by contrast, "marketing warranties" designed to encourage purchase despite the fact that the fragile nature of those stones commonly leads to breakage. It's better to have a stone that really will last for years, than one you'll spend time and money shipping back to the manufacturer frequently because it broke again. In fact, many stones on the market break so easily and so frequently that users simply quit using them out of frustration. FibraMent is a true commercial quality product that costs a few dollars more than some in the short run, and much less in the long run.